The name Chai Buey literally means 'leftovers', in many Malaysian Chinese household, this is one of the essential part of the any celebrations especially Chinese new year, after days of cooking and eating big (meat) meals for celebration, all we and our stomach want is probably just a simple easy to digest dish. This dish is also a very clever way to use leftover meat dishes, the main ingredient used in this dish is Assam keping--"Garcinia Cambogia", a potent ingredient that gave the dish its distinctive sourish taste. Assam Keping/Garcinia Cambogia is also used to aid digestion and weight control in the west, you can find it in capsule forms too. By the sound of it, you can already feel that this dish is not only delicious, it also gives our overworked digest system a much needed break during the weeks long of celebration. Preparing it is also easy and laborless, it is just a matter of adding all the leftover meat dishes and vegetables into a big pot and simmer until everything is tender and flavor well blended. The Assam keping and dried chillies came in to give it a sourish and spicy kick. Since the leftover dishes added may be different every time every household, we can safely say that this dish could turn out slightly different every time it is made! Which is another reason why it is so enticing! 1. Since I do not have any leftover meat dishes at home, I made a simple roast pork belly to go with this dish. Cut pork belly into big chunk. Marinate with 1 tbsp of soy sauce and 1 tbsp of cooking wine overnight. Place the pork pieces over a greased baking pan, broil for 10 minutes. 2. Add the roasted pork with dried chillies, Assam keping and whole head of garlic. 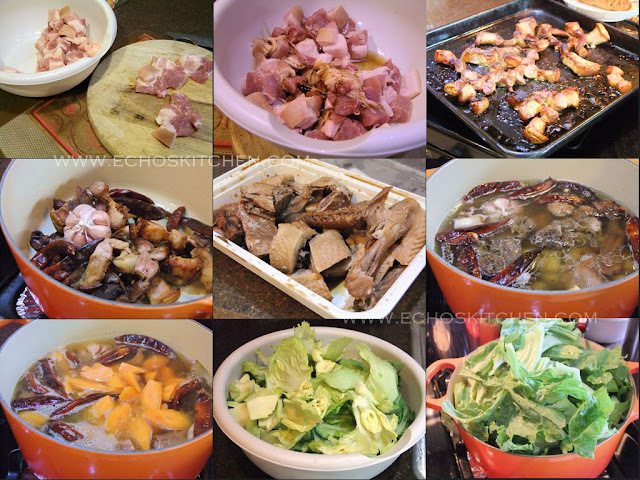 I also added a few pieces of duck stew that I have in the fridge. 3. Add 1 litre water into the pot and bring to boil, cook for 3-5 minutes, add carrot pieces and boil for another 5 minutes. Season with salt and sugar (this really is depending on the taste of those meat dishes you add into the stew). 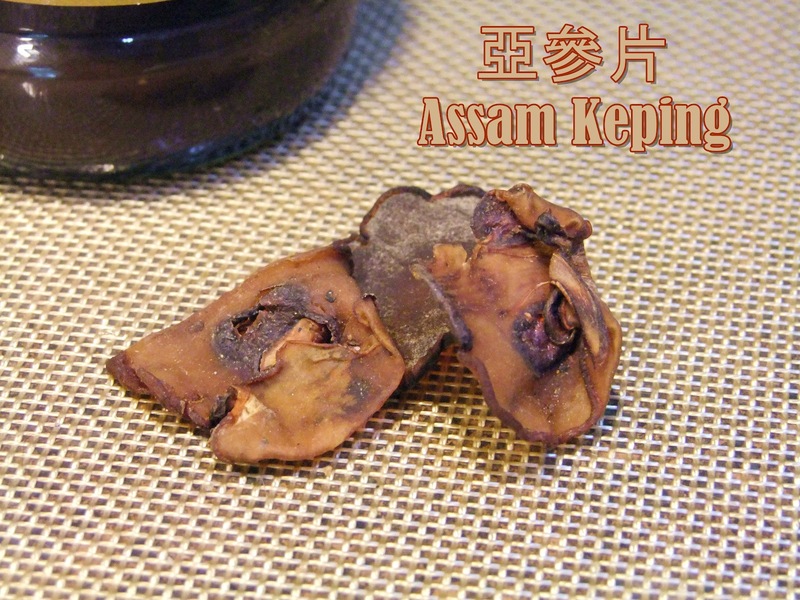 Note: You can add more Assam keping if the taste is less sour. 4. Cleaned and break the mustard green with hand, I personally think breaking the mustard without cutting it makes better texture in the dish, you can also cut the mustard into big pieces using knife. Add the mustard green and continue cooking for another 20-30 minutes or until the mustard green is soft and tender.